Christmas is a largely commercial affair in Japan. Of course, there are plenty of decorations put up, and that starts in November, but I don’t expect it is truly celebrated by anyone except the 1% of the population which is Christian. However, I would say that people enjoy it, in the same way they enjoy Valentine’s Day or Hallowe’en. Christmas Eve is the big date night of the year, and through some very clever marketing many Japanese people are convinced that a bucket of fried chicken from KFC and strawberry shortcake from the local convenience store are the perfect dinner on the 25th. Japanese people generally don’t exchange Christmas presents, and by the morning of the 26th all the decorations are gone, soon to be replaced with the traditional Shinto New Year decorations. For anyone newly-arrived in Japan, this sudden absence of all things Christmassy can be a shock, especially for someone feeling a little homesick and still getting used to the idea that December 25th is just another working day. For Japanese people, the big celebration is New Year (正月). 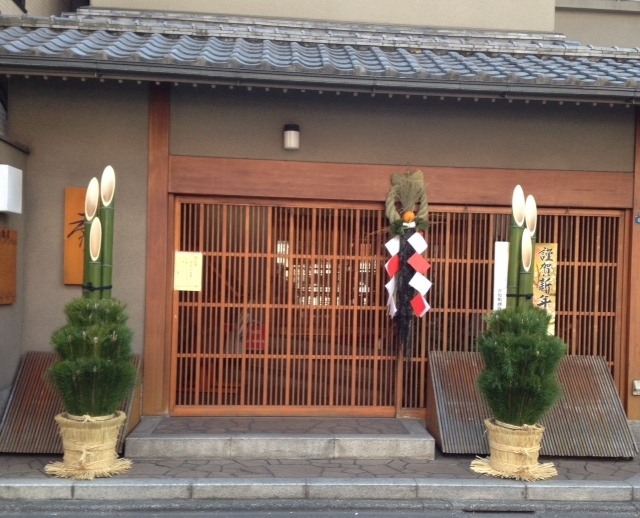 As shops shut down just before the end of the year, they put up New Year signs on their doors and kadomatsu (bamboo and pine decorations) on either side of the entrance. Having spent January 1st in a very traditional way, I spent the afternoon of January 2nd in a way more recognisable to my students as a New Year tradition: the sales. January (or these days, end-of-December) sales are not a uniquely Japanese phenomenon. In many countries one of the first things people want to do after Christmas is go to the shops to return or exchange gifts and spend money or gift tokens they have been given. As I already mentioned, Japanese people don’t exchange Christmas gifts, but anyone under twenty can look forward to receiving otoshidama (お年玉) at New Year. These are small envelopes containing money; gifts from parents, grandparents and other relatives. Many young people save all they are given, the reckless few spend it all, but often there is a compromise; they save some and they spend some. Shops re-open on January 2nd or a little later and are hoping that some of this New Year money is coming their way. 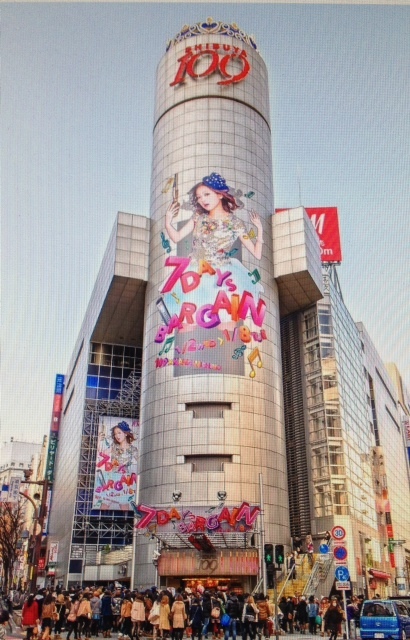 For high school girls, there are two places which are a kind of mecca on any day of the year; Takeshita Dori (竹下通り) in Harajuku, and the 109 building in Shibuya. Yesterday I went shopping with someone visiting Tokyo, and we decided to go to the mothership, Shibuya 109. Before I went, someone told me they thought I was crazy even thinking about going there on January 2nd, but we were on a shopping mission, and nowhere else would do. Yesterday was the first day of the ‘7 days bargain’ and in the early afternoon it was absolutely packed. The noise levels were excruciating and there were personnel everywhere guiding people along, particularly near the escalators. There are eight floors, and each one is a collection of different shops. The escalators form the centre of the building, so the best way to see everything is to go up the escalator, then walk all the way round to see what you can find. Every shop was selling lucky bags or fukubukuro (福袋), sealed bags containing a variety of items. These bags are not cheap, most of the ones I saw yesterday started at ¥10,000, but you know that the value of the contents is more than that, you just don’t know what you’re going to get. At places like the Apple store you might get an iPad or a Macbook, and so some really determined people will camp out the night before (or maybe even longer) to ensure that they get their hands on such a bargain. Back to the 109 building. Not only was every shop selling lucky bags, but there was at least one person, usually a young woman, shouting to attract attention. The crowds, the loud music, the screeching . . . you have no idea. We went up an escalator, round the floor, up the next escalator, round the next floor . . . we were on a mission for footwear, and so I can tell you that there are very few shops selling only shoes and boots. I think we found three. There was one on the first floor, one around the third or fourth floor, and one right at the top on the eighth. It was an experience. The feeling of having all my senses bombarded was amazing, the only other time I have felt that was when someone took me into a pachinko parlour years ago, but this was even more extreme because of the crowds. Having successfully found something to buy, we headed straight down the escalators and emerged, gasping for air, into the afternoon sunshine. The Shibuya 109 building. Not for the faint-hearted. 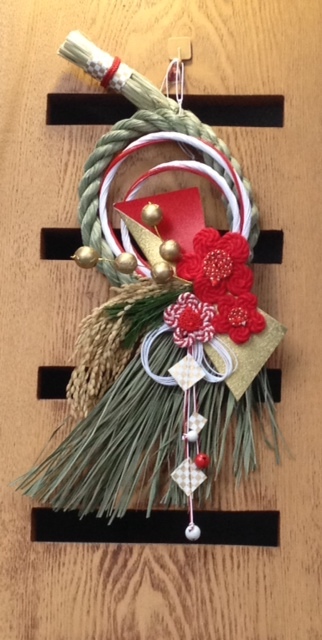 This entry was posted in Japan, Japanese festivals and tagged Christmas, 福袋, Japan, lucky bags, New Year in Tokyo, seven lucky gods, Shibuya, Shibuya 109, Tokyo on January 3, 2014 by tokyopurplegirl. Demons out! Good luck in! Today is Setsubun (節分), which means nothing more thrilling than ‘seasonal division’, or ‘seasonal separation’ but is also known as the ‘bean-throwing festival’, which clearly sounds like far more fun. 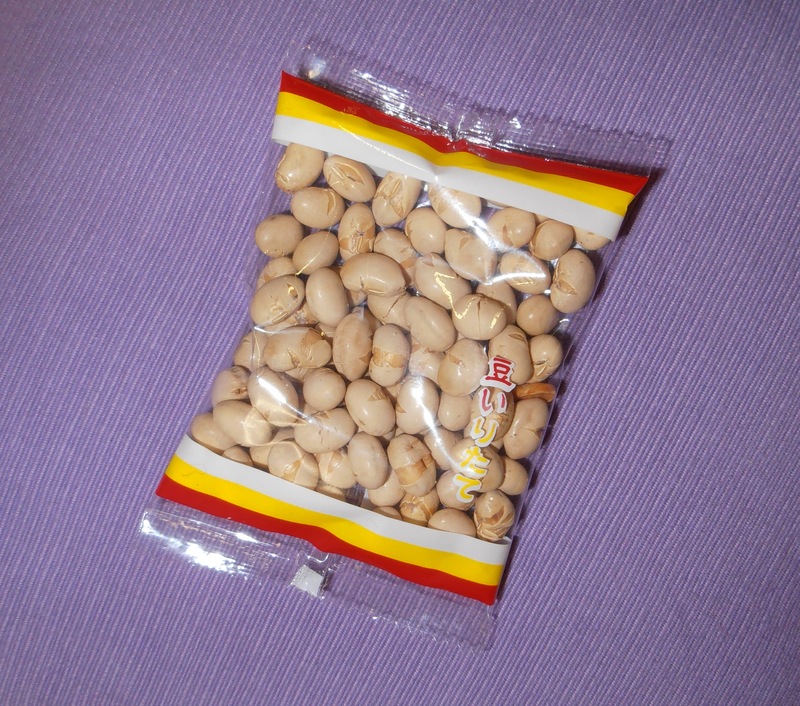 For a couple of weeks now, my local convenience store has been selling bags of roasted soybeans as part of a kit, with a plastic mask of a rather fearsome-looking red-faced demon, like the one at the top of this post. Traditionally, the father in a family takes the part of the demon, and, wearing the mask, is chased out of the home by the other members of the family, hurling roasted soybeans at him and shouting, ‘Oni wa soto! 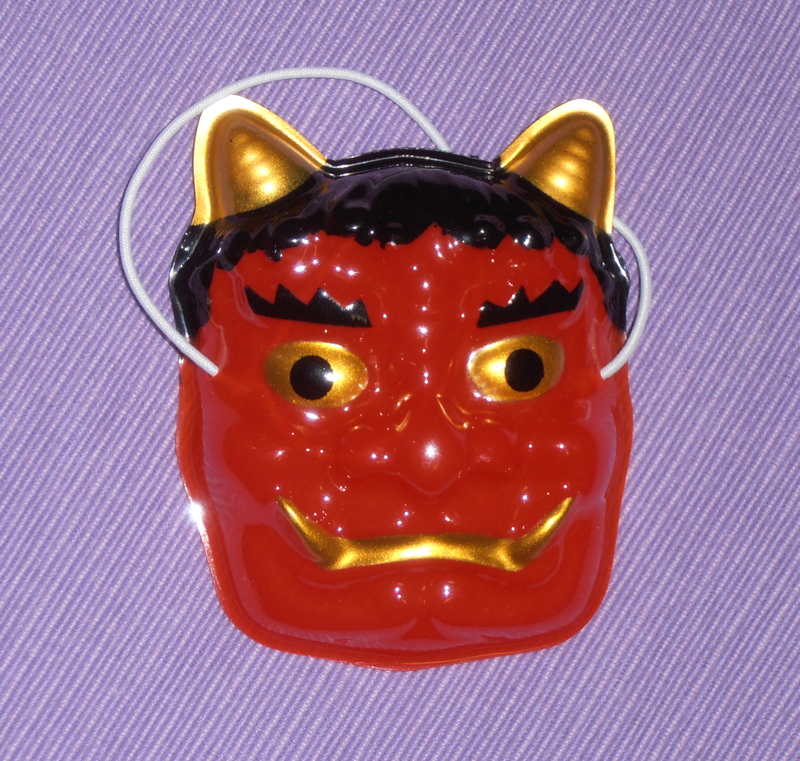 Fuku wa uchi!’ (鬼は外！福は内！), which translates to the title of this post, ‘Demons out! Good luck in!’ Apparently, this custom is not as common as it used to be, and people are more likely to go to a temple or shrine and watch a similar ceremony there instead. I don’t know about that, there have certainly been plenty of roasted soy beans and demon masks on sale in my neighbourhood. I was initially concerned that there wouldn’t be enough beans for my age plus one, but there were plenty and it seems I have a couple of decades to go before that becomes an issue. Another Setsubun custom that has made its way up from Kansai (west Japan, Osaka), is the eating of large makizushi, or rolled sushi, called ehomaki (恵方巻), or ‘direction of blessing roll’, and when I first lived in Japan I didn’t see them in Kanto (east Japan, Tokyo), but in the last few years they have been sold in supermarkets and convenience stores. The promotional effort is similar to the marketing used to sell strawberry shortcakes for Christmas, and my local convenience stores have been taking reservations for weeks. These rolls are traditionally eaten facing a certain direction, which I believe changes from year to year, and without stopping, while making a wish. Given the size of these things, it sounds like quite a challenge. On my way home this afternoon, even the local Indian restaurant had got in on the act, selling what looked like large tortillas filled with some kind of curry mixture. Setsubun is not a national holiday, but since it is close to the lunar New Year celebrated in other parts of Asia, it feels to me like the first sign that spring is just around the corner. Most days it’s still quite cold in Tokyo, but yesterday was remarkably mild, the sun shines daily and I saw the first plum blossoms today. We’ve chased the demons out, ushered good luck in, and the blossoms are starting to open. It feels like we’re on the threshold of a new season. This entry was posted in Japanese festivals and tagged 節分, fuku, Japanese snacks, Kansai, kanto, oni, roasted soybeans, Setsubun on February 3, 2013 by tokyopurplegirl.